DW Hausa com is the department of Deutsche Welle which broadcast global latest news from central Europe in northern Nigerian hausa speaking language. DW Radio Hausa (over 60 years of Deutsche Welle) is Germany's international broadcasting service, producing TV, radio and Internet programming for listener in 30 languages. The DW Radio Hausa Service of Deutsche Welle (Voice of Germany) station provides latest news in Nigeria in hausa language. the Hausa programme of the German radio station, Deutsche Welle. DW Hausa is an International broadcasters radio service which broadcast in hausa language to the West African countires. International news providers are perceived to have an important role to play, especially in Nigeria and Niger. They provide balance and an alternative view to local news which are not widely trusted. There is a perception and opinion among the wider audience that local radio news is distorted. It is a good thing that people in other countries, e.g. dw hausa com Deutsche Welle (Voice of Germany) have to spend their own resources to come and tell us what is happening in our own country via dw radio hausa. To provide a forum in Europe and on other continents to German and other points of view on important issues, with the aim of fostering understanding and exchange between cultures and people, as well as to contribute to promotion of the German language. DW "Deutsche Welle"... literally "German wave" is Germany's international broadcaster, producing television, radio and Internet Online content. DW operates independently from state authorities, according to Article 5 of the German constitution. DW reports to the German parliament and its funding is decided on a yearly basis by the government. DW Radio started regular shortwave broadcasting in 1953 from West Germany, presumably driven by the need to re-establish the reputation of Germany in the world. Shortwave broadcasts in German were discontinued in October 2011 (Deutsch Welle 2011), but transmission has continued in ten African and Asian languages. However, DW generally endeavors to establish partnerships for its FM transmissions, as already undertaken with Rdaio Monte Carlo Doualiya (RMC) for its programming in Arabic (Deutscher Bundestag 2010). TV is now DW's key service, distributed in English and German in Asia (since 2009 through DW-TV Asien and DW-TV Asia+), Europe,Africa and the US; Spanish and German in Latin America; in Arabic and English in the Middle East; and in Russia and German in Russia. DW offers information as well as audio and video streaming on the Internet and mobile phones in 30 different languages. In pursuit of its multiplatform strategy and in order to reduce costs, editorial teams for DW radio and Internet service were combined called DW-AKADEMIE, and educational activity providing training to journalists and media producers worldwide, is financed by the Federal Ministry for Economic Cooperation and Development. 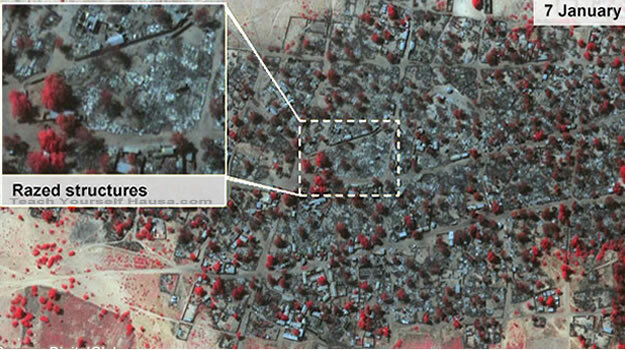 DW hausa or DW Hausa com report on news Nigeria Boko Haram which bombs Baga where satellite photographs of the group Human Rights Amnesty International show that nearly housing over 3700 attack damage. 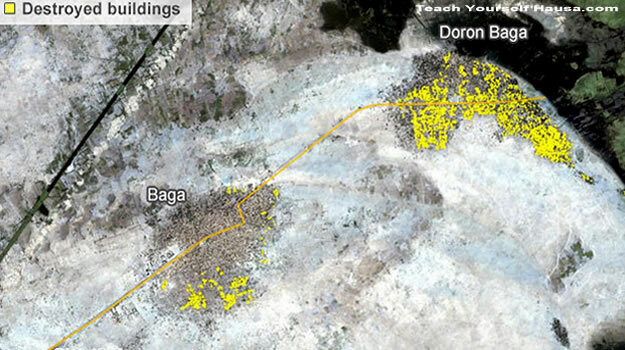 Below pictures show some 3700 structures damaged or destroyed in Baga and neighbouring village Doron Baga last week. 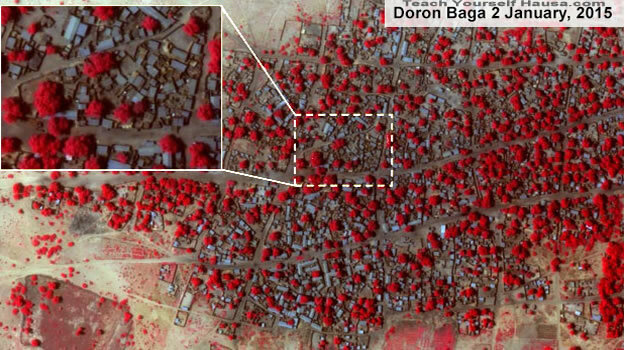 The UK-based human-rights group Amnesty International released satellite images of towns attacked by Boko Haram, suggesting widespread destruction and a high death toll. Survivors speak of killing on a huge scale, but Nigeria's government has disputed reports that as many as 2000 were killed, putting the toll at just 150. How did the government will continue slave society true solution? Note that the Satellite images have been processed to make vegetation change clearer. Red dot areas indicate healthy vegetation. From the starts, boko haram was oppose to Western education - Boko Haram means "Western education is forbidden" in the Hausa language. Arewa ita yanzu take ganin nata yakin duniyar, Allah ya kyauta... meaning North is now feeling her world war, God works in mysterious ways. In the Rariya hausa newspaper and dw hausa rikicin boko haram. The Hausa Radio Deutsche Welle (dw hausa) reports the breaking or latest news in Nigeria. DW Hausa is one of the top radio service that provides a comprehensive up to date news coverage, breaking news, top news headlines from West African Nigeria and worldwide. Latest news in Nigeria today on boko haram is what dominated the radio waves as Nigerians expresses their opinion on the politics of fighting Jihadists Boko Haram. When reporting Nigerian news, Deutsch Welle DW Hausa call experts locally whilst the BBC Hausa Service has correspondents in place on the ground with local knowledge. It plays a role in educating the nations. DW hausa service provides a lifeline for rural communities that are not reached by other media. A world of possibilities is waiting for you - the new way to tune into DW service at home. You have the opportunity to tune into and listern to quality programming in English, as well as Hausa, Amharic, Portuguese, French and Kiswahili with DWs radio service. It's all available on the same satellite on SES-5 (also known as Astra 4B and Sirius 5) - so tune in as soon as possible. Deutsch Welle (DW TV) or dw television has made it easier than ever to tune into its English television channel for Africa (dw tv hausa?). DW is now available on SES-5 - a Ku-band satellite which allows you to receive DW direct to home. This change means that all viewers in Sub-sahara Africa can now use a normal dish (80 cm to 180 cm) to tune into DW around the clock. DW offers viewers direct access into international news and European insights, covering everything from politics, business, culture, dw sports, to science and technology - in English (future in Hausa), 24 hours a day and seven days a week. Get up close and personal with journalists from around the globe as they share their view of their homeland and continent, their culture and their issues on World Stories. You can check out the affects that globalization is having on people throughout the world with DW Global 3000. These are just two great shows waiting for you on DW. DW Radio (Hausa Service) provides International news across all subjects. It provides an alternative news 3 source of international news in the local hausa language. DW Hausa (www dw hausa) Deutsch Welle provides general news with occasional documentaries of interest. Much smaller audience. However, the Hausa Service of the Deutsche Welle (Voice of Germany) radio station was thin on the ground, but good alternative to the BBC Hausa service. Deutsche Welle DW Hausa radio is the station that broadcasts and presents current news online radio for baiyanar on how European countries are looking at things from the audience through out the world. DW hausa goal is to encourage understanding on how Germany as a free country and roots with European culture, and as a country of moderate, democratic, ethical constitution and rule of law. DW programs broadcasts to the audience of about 86 million viewers throughout the world. Let us say that a word is an EXISTING WORD from the moment it is first coined. The word may be ITEM-FAMILIAR to individual speakers without having become part of the norm of the language. A word is ESTABLISHED once it becomes part of the norm, that is, once it is item-familiar to a large enough sub-set of the speech community. The abbreviation "SH" is used for Standard Hausa, the dialect generally found in Hausa newspapers and radio stations and in the Hausa programme of the German radio station, Deutsche Welle. Many Hausa speakers are not aware that words like sh�ug�baa "leader" were Hausa verbal compounds. The dw hausa service is one of the most reliable source of current Hausa news service. 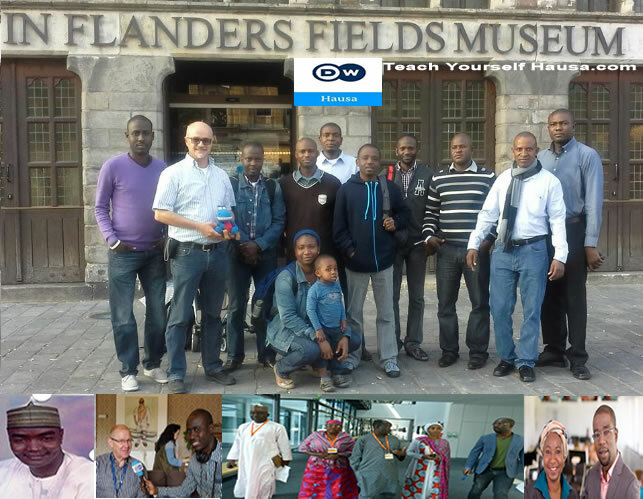 Below is the dw hausa staff pictures or the employees section DW Hausa visit the city of Ypress in Belgium. In below DW Hausa Photos or picture, you will see workers of Hausa section of DW is in front of the In Flanfers Fields Museum in Ypres, Belgium. DW Hausa section of Deutsche Welle is a global news from common market European Union (EU) central Europe. DW Hausa com introduce the important news in the Facebook FB (dw hausa facebook), and encourage the reading website users to write to them freely. DW hausa will remove or eliminate ideas that do not match or fit their mission. Above from left; Ahmed Salisu, Thomas Mosch, Yusuf Bala, Usman Shehu Usman, Salissou Issa, Muntaqa Ahiwa, Aliyu Abdullahi Imam, Abdourahmane Hassane, Salissou Boukari, da Sulaiman Babayo and Daga tsugune kuma Pinado Abdu Waba.